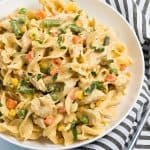 I just love accidental recipes that become a keeper when you’re in a crunch… like this Instant Pot Cheesy Chicken, Noodles and Vegetables. Last week I did a lot of work on my computer. A LOT. I was totally overdue on going grocery shopping and super-tired. What would I normally do in this situation? Order takeout. But I was totally craving something home-cooked. 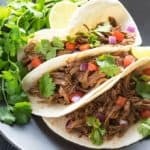 Going to the grocery store was not an option because I was so tired, so I broke out my Instant Pot and raided my fridge and pantry to see what I could throw together. 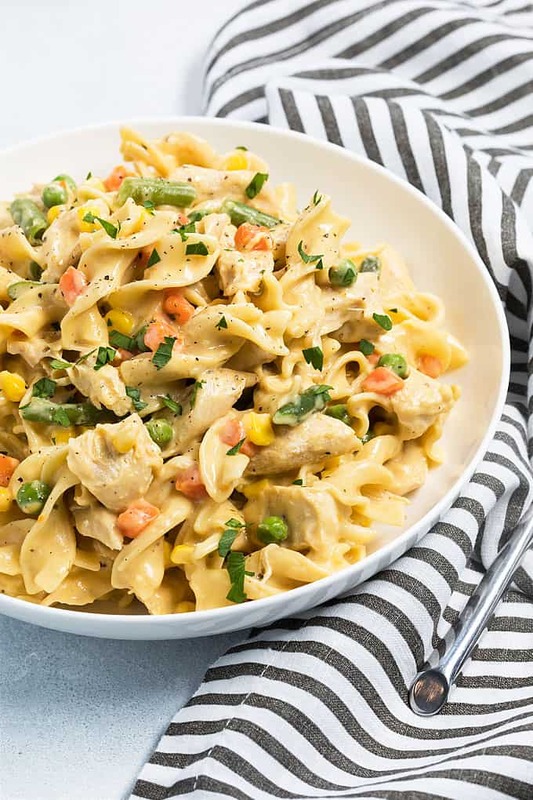 What will you need for this Instant Pot Cheesy Chicken, Noodles and Vegetables? I threw together this delicious one pot meal in just 40 minutes TOTAL (includes time to come to pressure) with basic staple ingredients I always keep on-hand. 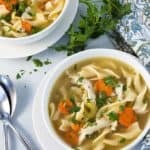 I used cream of chicken soup with herbs and would suggest that if you use regular cream of chicken soup to season with a few of your favorite dried herbs to your personal preference. 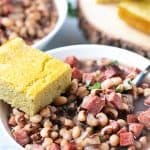 An easy and hearty one pot meal in just 40 minutes total! Place chicken in the bottom of your Instant Pot and add broth. Place the lid on and lock. Steam release knob should be set on “sealing”. Cook on manual setting (high pressure) for 10 minutes. Allow the pressure to naturally release for 5 minutes, then quick release remaining pressure. Once pressure has completely released, remove chicken with tongs and transfer to a cutting board, leaving the liquid in the pot. Turn off Instant Pot and then set to saute setting. Add 6 cups of water, stir and allow to come to a boil. Once boiling, add noodles and mixed vegetables. Cook for 7-8 minutes (or until noodles are cooked) stirring occasionally. 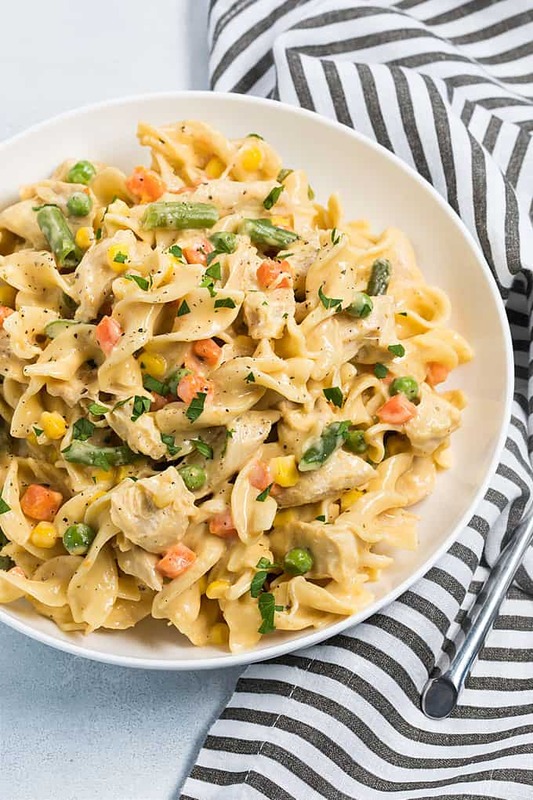 Shred or cube cooked chicken while noodles and vegetables are cooking. 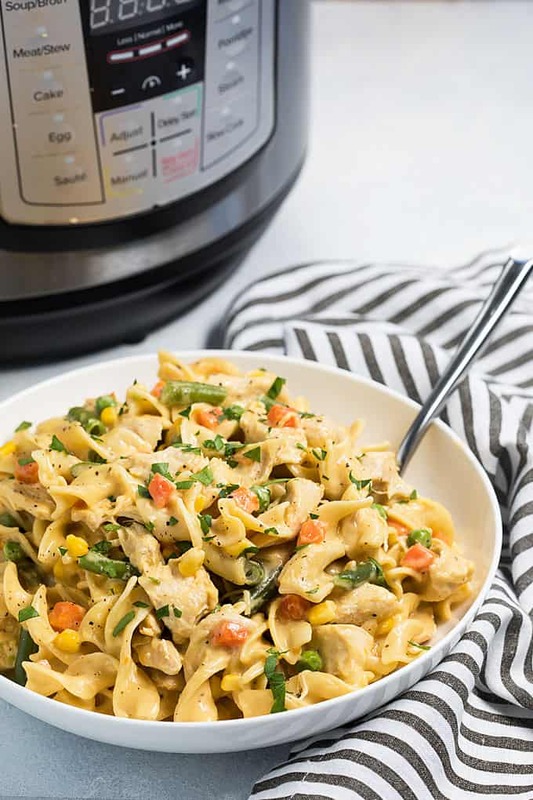 Once noodles and vegetables are cooked, turn Instant Pot off. Remove insert (using oven mitts – insert will be hot) and carefully pour contents of pot in a colander to drain. 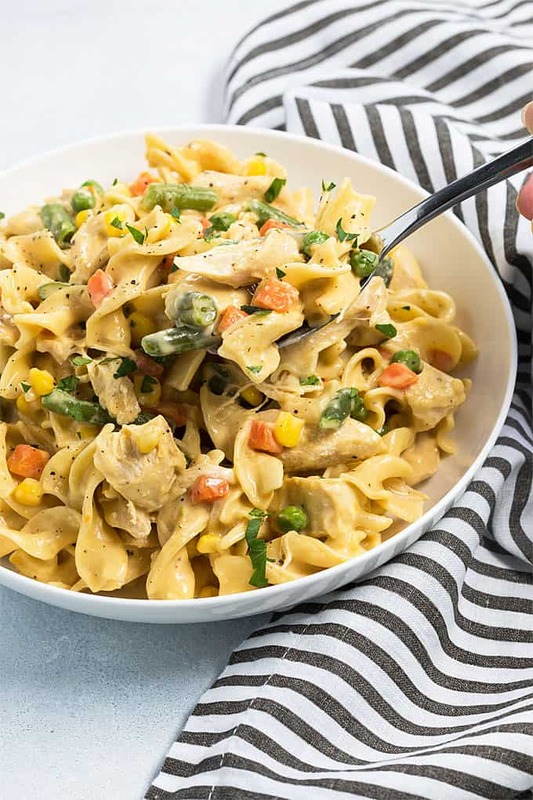 Return egg noodles and vegetables back to pot and place back into Instant Pot. Set to saute setting and add milk, soup, cheese and cooked shredded or cubed chicken. Stir until combined and cheese is melted. Turn off Instant Pot and season with desired amounts of salt and pepper. Cook time includes time for pot to come to pressure and for liquid to boil for noodles and vegetables. 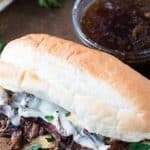 I used an Instant Pot LUX80 8-quart in this recipe. This is absolutely delicious! I made it for guests and they all loved it! Would I be able to do this with frozen chicken? I always forget to take meat out of the freezer. Would I maybe cook at high pressure for 20 minutes instead of 10? Hi Cassie, I can’t say with certainty because I haven’t made this with frozen chicken – Let us know how it turns out if you try it! Do not adjust the time. Frozen meat will thaw as it comes to pressure. It does take longer to come to pressure but it will be done after 10 minutes of actual pressure cooking time. I just finished making this recipe (with frozen chicken). It’s fabulous by the way. But there is no need to change the cook time. Hi Leslie, I can’t say with 100% certainty because I’ve never tested this recipe in a 6-quart Instant Pot. 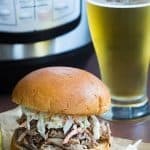 Here is an article on different size Instant Pot cooking differences; I hope it helps! I made the recipe in my 6qt Duo last night and it turned out really good. My family loved it. 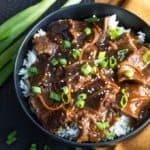 Sound good and I totally want to make it, but being new to instant pot cooking I have to ask if I use fresh veggies instead of frozen how much would I need to adjust the amount of liquid or cooking times?